Eddie - Diamond in the Ruff Rescue & Rehab, Inc.
Eddie is an 8 month old tan Bulldog mix. Eddie was diagnosed with Chondrodysplasia (no elbows) at only 5 weeks of age. At that time, the owners said that they wanted to give Eddie a chance at life, instead of euthanasia, because they had a friend interested in adopting Eddie. Unfortunately, the adoption fell through because they felt incapable of affording an elbow-less dog. At five months of age, the owners took Eddie back to the vet and asked for him to be euthanized. The vet noticed that Eddie was happy, and seemed to have no issues except for his lack of elbows. The vet contacted us to see if we could help Eddie find a forever home. We took him in and researched how we could help Eddie get around better, and enjoy his life to the fullest. 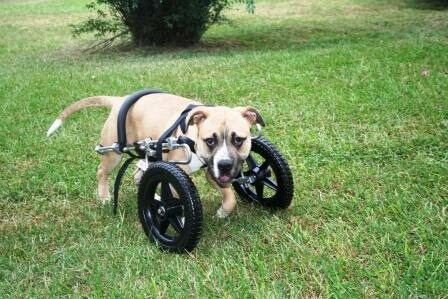 We had used wheelchairs for handicapped animals before, and felt like it was a great idea for Eddie. The wheelchair cost us $419.00, and we raised it all in donations. During the fundraising for Eddie’s wheelchair, he stayed in boarding at the vet’s office. There was a family very interested in adopting Eddie when his wheelchair arrived, so we boarded Eddie with the veterinarian until the wheelchair was completed. Two days after Eddie’s wheelchair came, and he was transferred to his adopted home, he was returned back to us. The family complained that they did not feel fit to take care of Eddie because they were not capable of picking him up due to back problems. We were confused by this because from what we have seen of Eddie, he is capable of moving around (even climbing and jumping on furniture) without any help. We were very shocked with Eddie’s return, because this family wanted him from the day we started fundraising for his wheelchair. After this disappointment, Eddie was put into a foster home. At adoption event after he got his wheelchair, he made an impression on a family who couldn't forget about him, and applied for him online! Eddie is now in his forever home, where he has taken over the loveseat! Thank you to everyone who donated for his wheelchair and made this possible!